Nokia has unveiled details of its N-Gage handheld game phone gadget. The move puts it in direct competition with Asian giant Nintendo whose Gameboy dominates the market for handheld games. Sega is signed up to provide titles for Nokia's N-Gage machine. The N-Gage launch is part of a wider strategy by all handset makers to get consumers doing more with their phones. 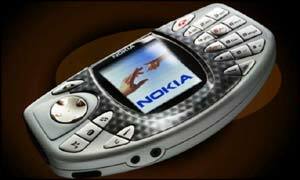 Nokia first announced its plans for the N-Gage in November last year. At a press conference on Wednesday, the company said it will be available during the fourth quarter of 2003 around the world, but a price has not been set. Although many of the latest phones have better games on board thanks to colour screens and fast processors, the N-Gage will be for more dedicated fans. Games for the N-Gage will be on memory cards that slot into the gadget. Sega is planning to release titles featuring its mascot Sonic the Hedgehog on the N-Gage. In launching the N-Gage Nokia is taking on Nintendo which has sold more than 24 million Gameboy Advance units worldwide since its launch in March 2001. To compete with Nintendo's Gameboy that sells for 130euro (£85), Nokia will probably have to be prepared to make a loss on every N-Gage sold. Last edited by zErO; February 16th, 2003 at 03:36 AM. All times are GMT. The time now is 16:50 PM.